I developed this chart by combining my own experience with guidelines from the Craft Yarn Council and Ravelry yarn standards. 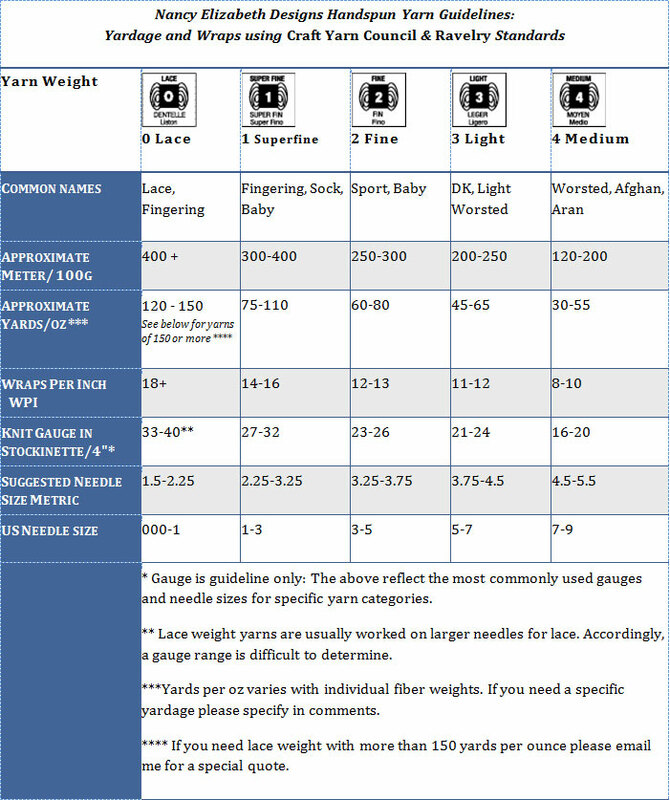 You will find 5 of the most common yarn weights with standard and common names as well as yardage in both metric and US standards, wraps per inch (WPI), gauge and suggested needle size. Standard Yarn Weights: These measurements are approximate due to the handmade nature and individual fiber content of each yarn. I use these as my guidelines when I spin. I hope they will help you to determine which choice to make when ordering your hand spun yarns. Please keep in mind that it is easier to return an unopened skein than it is to get another one to match. I cannot guarantee a match at a later date. When in doubt please order extra. If you have a specific yardage that you require please let me know when you order. I will be custom spinning this yarn just for you so lets work together to make sure your hand spun yarn is perfect for your project. Love your yarns and want to attempt your child’s hooded pullover, but am baffled by your color selections. Have you a color chart somewhere I’m missing? Would love to support artisans, especially those on Craftsy and Etsy, two of my favorites!